I have a question about sales estimations. Does anyone have any ballpark figures as to the monthly fluctuations in the chocolate business? How did you know how to budget for opening your own shop? Did you price your product line off your break-even; or did you determine your budget for location, hardwares, etc by figuring out your price and estimating how many you'd sell in a week? I would be so greatful for any enlightenment any of my fellow eGulleters could shed on this topic! 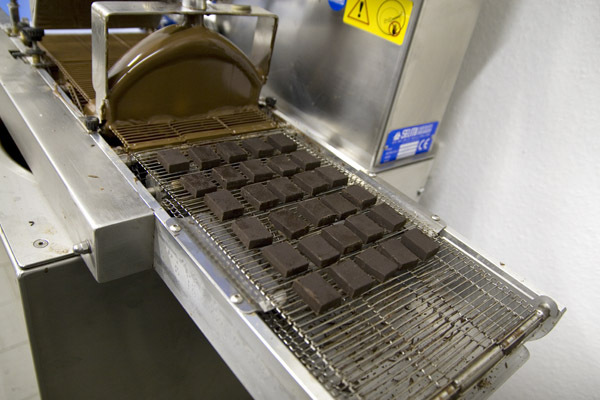 Many other great topics on starting chocolate businesses HERE including pricing, packaging, etc. Good luck! that does help. How did you work out the storage of the chocolates? Do you mainly do enrobed or molded pieces? I do a mix of enrobed and molded pieces, and the ratio is still working itself out. 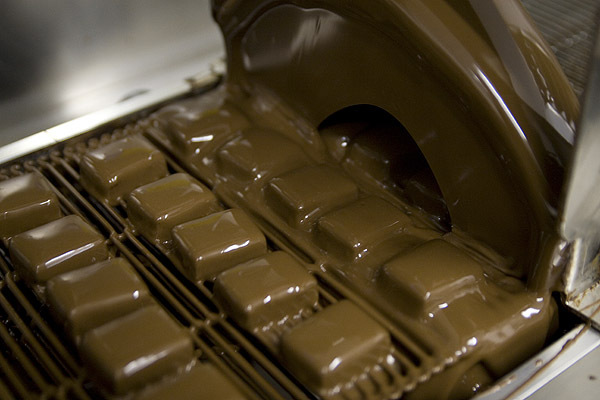 I won't be storing chocolate there much, if at all, since I'm just making to order and not maintaining a stock. One of the challenges of working in a space that's not just mine is how to manage air-drying/crusting times. Ultimately, I'm going to investigate getting some sort of enclosed cabinet that I can use for that (like this one, although that's really much bigger than I need), but for now I'll just be managing my work times around their schedule. Fortunately, they are closed on Sundays, so I can leave things out overnight on Saturday. Anyone have any thoughts on whether using a fan would help speed up this process? Although I expect that sometimes I'll have to "cheat" and use the refrigerator. You're NOT cheating by using the frig. That's a myth. After working for others for the past 12 years and having recently been laid off I've decided to start my own business. I will focus mostly on chocolates but will do desserts down the way. This a great thread with lots of useful information will help along the way. One thing I would hope others could contribute is what is the minimum capital needed to start. I know this is different for each person, but if you wouldn't mind letting me/us know what you spent that would be great. I will be looking for investors and would like to make sure I get enough money to get going. My thought is somewhere around $80,000. 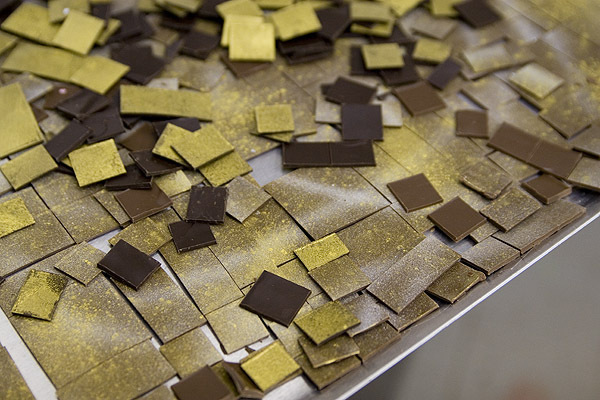 i own a french patisserie in cologne/germany and we recently added chocolate to our portfolio. 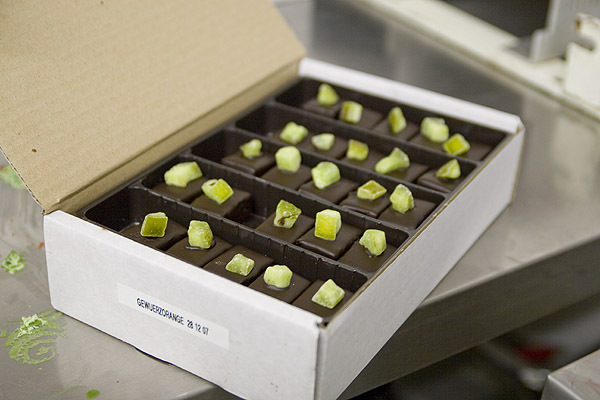 we produce enrobed chocolates, chocolate bars and confections. 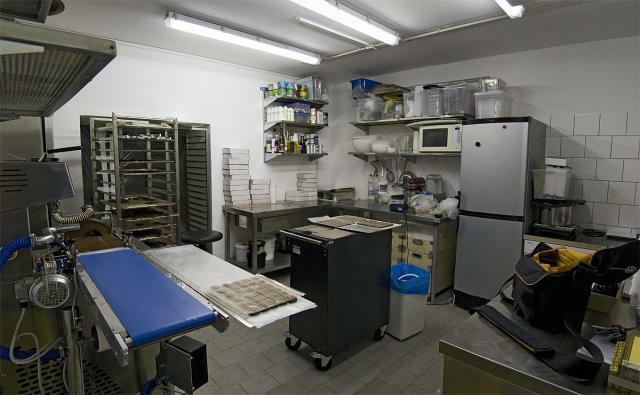 we built a small chocolate lab just next rooom to one of our shops (3 in total) its about 12 qm and equipped with a chocolate cooling cabinet, a selmi chocolate workstation & enrober, a warming cabinet, a combined fridge and freezer (just for fruit purees, cream and such) and a few tables and shelves (ikea) we roughly spend on our lab about 40.000 euros (including small mat.) we are in production for about 6 weeks now and i really have to tell you i couldnt do it witout my selmi. 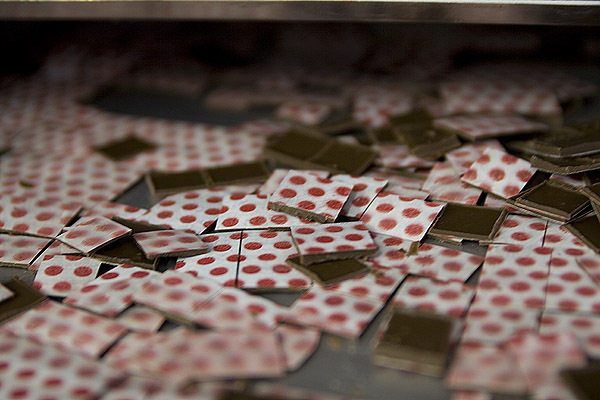 its a continuos temperer that alows you to throw in unmelted or melted chocolate it doesnt matter. 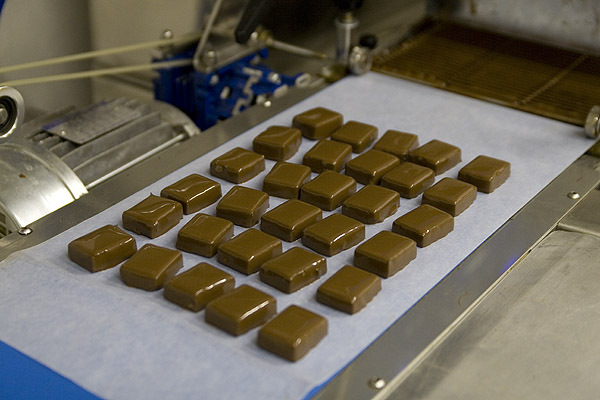 the nice thing is you will always have tempered chocolate in 15 min. even if you havent a lot of time you can always enrobe something without a lot of preparation and time. if you want i can u/l a few pictures of my lab, so you can have a look. if you want i can u/l a few pictures of my lab, so you can have a look. I just looked at the Selmi workstation and it looks like what I want for my business. I emailed them for more information. 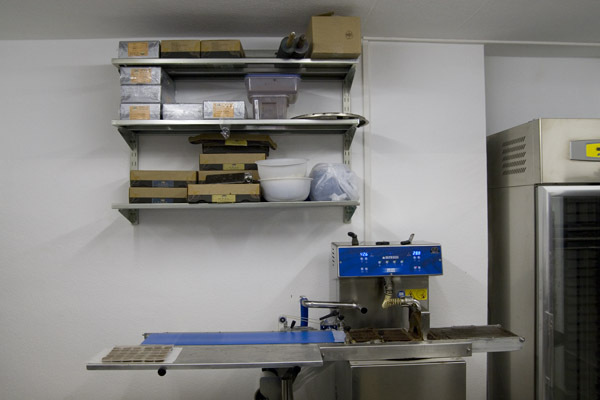 what you see here is a panorama of the lab, its only about 12 qm big (small) the doorway to the left is still covered with foil, behind it there is still a lot of woodworking going on, but because chocolate is so delicate we sealed it completely. 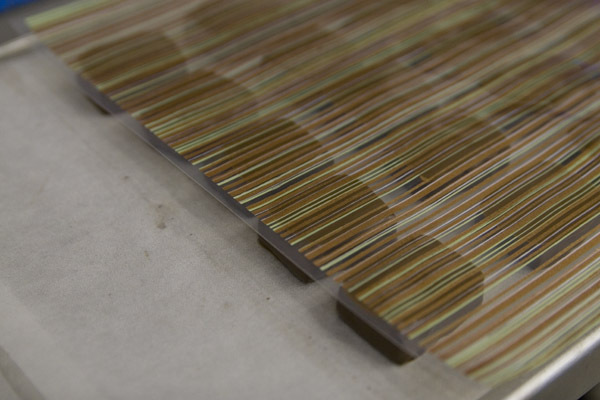 when this shop opens in a few days people will be able to watch from the shop into production. 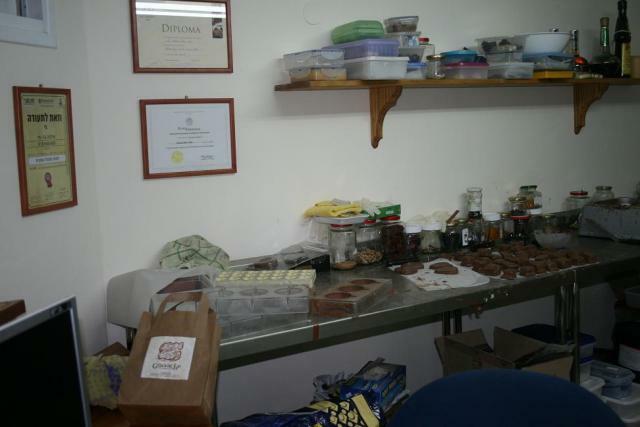 besides this shop we sell our chocolates in our two other outlets. the heart of the lab is my selmi "plus" workstation which is a computer controlled continous tempering machine with a max. 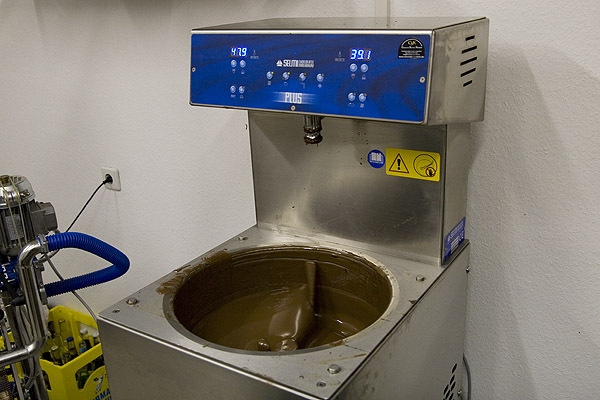 quantity of 25 kg of chocolate. 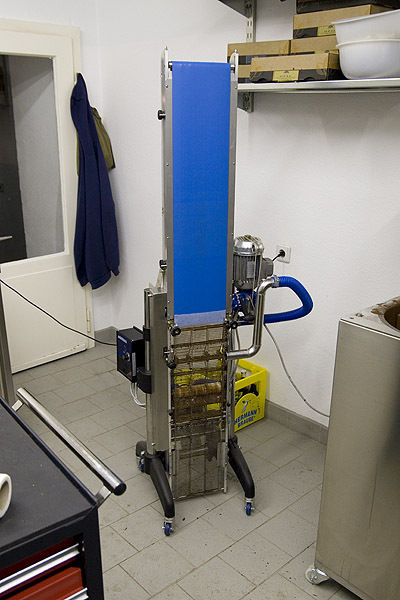 this picture shows the "naked" machine, which can be equipped with either a enrobing belt or a heated vibrating table. on the top display you see to displays the left one shows the melting kettle temp. the right one shows the tempering cylinder temp (the one that matters. 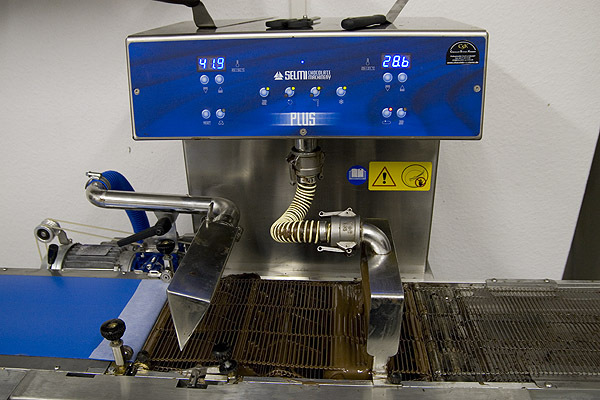 in the middle there are 4 buttons which are kettle heater, stirrer, pump and tempering. pretty much what you do in the morning is push stirrer, pump and tempering button and in 15 minutes you have tempered chocolate. 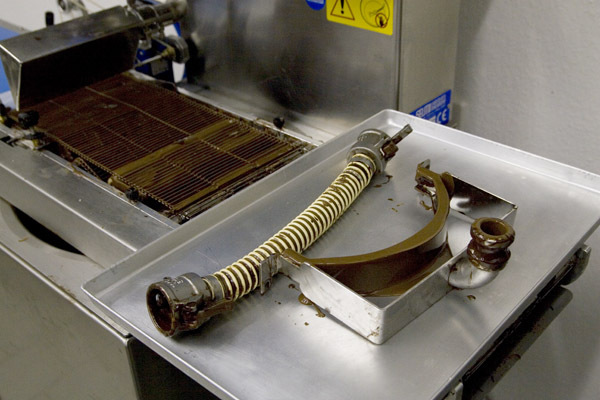 the nice thing is that you can always throw in melted chocolat, or even unmelted chocolate since only the chocolate that comes right out of the pump is tempered. 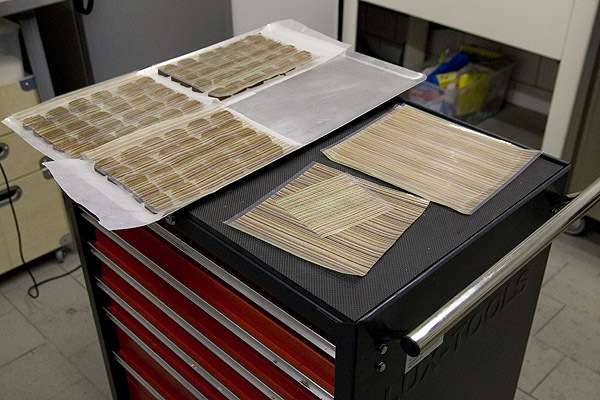 the whole setup (minus blower), the sheet on the left is for the enrober pieces. Question: how difficult is the enrober to clean? and how often does it need to be cleaned? 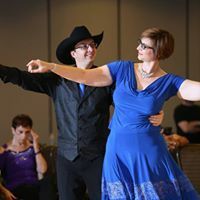 I never imagined that the enrobing belt would fold up -- that is really cool (obviously I am just an beginning amateur and have no idea what I'm talking about when it comes to large-scale production!). Thanks so much for posting the photos, I love seeing stuff like this. Yep, thanks for sharing your setup. The enrober was smaller than I thought. I'm hoping to take a course later in the year where we use an enrober - should free up time to make a few more centers. Wow, I had no idea that they'd be so easy to clean up. Super! Thank you for the pictures! It was really nice to see and read the explanations. Very kind of you and greatly appreciated by me! I WANT A CHOCOLATE LAB!!! Thanks for showing us. Dedicated space is such a beautiful thing. I was admiring that same temperer and enrober at Tomric last year. Do you use the heads for filling molds too? Are you considering the truffle attachment at all? Kerry, does Tomric sell the Selmi machines? I checked their website but didn't find what I was looking for. I emailed them but I think they are still on vacation. I think they are at some sort of pastry show. I spoke with Brian the other day. Same machine, but may have a different name on it. Thank you so much for finding the time to take pics and describe your production!!! It put things to prospect.I really love those selmi's ,I have asked an italian friend chocolatier and he is using them as well and love them . My little business has opened a few months ago. 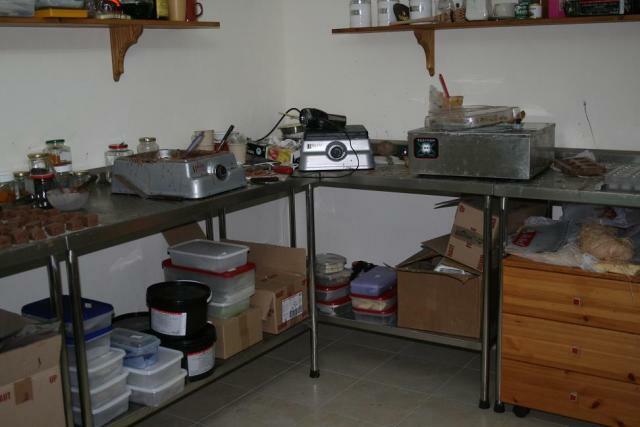 Here is a few pics of my "lab"- sorry it is such a mess- been a very busy two weeks.